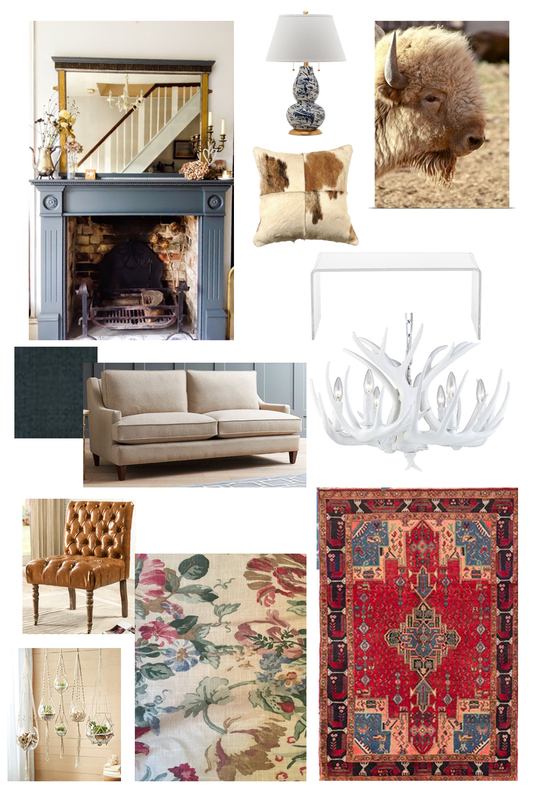 I’m so excited to dive into plans for our collected living room! There will be tons to come on this space in the next few weeks as we’re putting it together and working toward a reveal! When we decided to live in a smaller house for this next season, we were excited….for the most part. We felt really energized by the challenge of cutting our living space nearly in half to save renovation costs and have less invested in this house. It just made sense with what this next season holds for us….so much more White Buffalo story to come! But we knew there would be difficult parts of this journey. The biggest concern wasn’t even storage. If you remember from The White Buffalo Story series, I laid awake the night we considered doing a smaller house and by 6am, had figured out how we could make every square inch work and where we could put every single item that needed a place! But there was one thing we couldn’t “fix” without adding on…the tiny living room. The room is 13.5′ x 11′ and I know that may not sound super small. It’s much smaller than our last living room at 14′ x 18′. That was our biggest living room by far (the previous one had been about the size of what we’re doing now) and we LOVED it. We love entertaining and hosting groups at our house and this is where we hang out as a family. But it wasn’t just the square feet of this new living room that was the concern…it was the layout of and all we had to work around. This room isn’t just a living room. It’s the entry, the passage through to the rest of the house, the passage to Dax’s room and an entire wall is open to the dining and kitchen areas. That layout really adds to the challenge of creating a functional living room. There just isn’t a lot of space to put things and you have to keep several pathways open. I said in initial plans for this house that we were trying to re-use as much as we could, wherever we could. And we have in so many spots! But sadly, the living room isn’t one of them. While you will see some familiar items for sure and we’re re-using things to save where we can, most of the furniture is new. When we were debating buying this house and not increasing the size of the living room, that’s the one thing we both had to come to terms with: the living room would have to have new furniture. We measured and re-measured, but there was no way our big leather,over-sized Chesterfield or those dream chairs of mine would fit in here. Oh how I miss you last big living room where everything would fit. And, man…you sure were pretty. But there is purpose beyond big, beautiful living spaces here for us. We sold the leather sofa to go towards the new furniture we’d need and we ended up storing the chairs. Our initial idea with this move was to sell anything that didn’t have a place, but these along with a table Chris made me just couldn’t be parted with…especially knowing we may have room for them again one day. So, we had to start from scratch on this space and we had to find smaller-scale furniture. My absolute favorite source for furniture is Wayfair because they have a huge variety and great prices. I’ve partnered with them in the past for Rosie’s playroom and they were really excited about the ideas we had for this small living space: creating a functional, collected, and beautiful living room out of a really small, challenging space. I’m partnering with them on this space and couldn’t be more excited! We were really careful to choose items we’d purchase anyway, not just due to their style, but also their price tag and our budget. 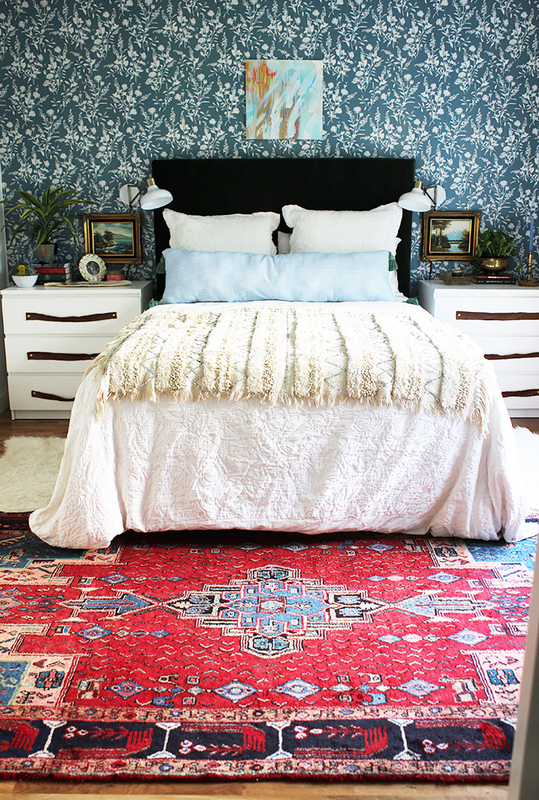 You may remember this from our last master bedroom! 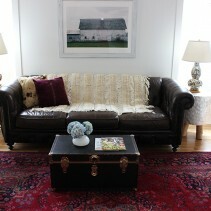 I started designing with that rug as my base and wanted small furniture and a layered, country, collected vibe! My first order of business was figuring out how in the world we could lay out this space. I considered going with a love seat in here to really save space, but we both knew it just wouldn’t work for how we function as a family. We like all piling up on the sofa and do want to have some seating for guests. So the answer was clear: a small scale sofa (but bigger than a standard love seat) and two small-scale chairs. This is not to exact scale, for sure, but it does give you a good idea. Since the wall the dining room is open, we’re able to float the chairs a little further back and still have clearance behind them to get to Dax’s room. I tried floating the couch there, but it’s much bigger and it really cut off the space, visually and functionally. Having the chairs there makes the space feel more continuous and open. I really wanted to preserve a conversation area and an entry area for how it functions for us, so we’re using our two nightstands from the last master bedroom (scroll back up to that photo to see) put together as an entry console right when you come in! The six drawers are awesome for storage and I like having a drop spot right inside the door. Our first thought for that wall was to build a wall of custom built-ins with storage and really make a statement there, but time and money didn’t allow for that. With finishing up the rest of the reno, it would take so long for that to be the priority, we decided to come up with an option using something we had that we could use immediately! And I’m so glad we did! Okay, so that’s a look at how the space is set up. Now let’s talk design! I’m thrilled for this room, y’all. 1.) Blue Fireplace – that inspiration image is what helped me decide on the fireplace color. I love it! 2.) Blue Marbled Lamps – you may recognize these from our last living room! I loved it in here and we were able to re-use something…win-win! 3.) Cowhide Pillow – I wanted to bring some rustic touches in here and I love cowhide. 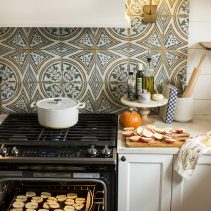 I also love layering textures and this brings so much texture into the space. It cozies it right up! You’ll notice I’m going with a lot less throw pillows in this space because there just isn’t room for them! So many of the ones I put in chairs and couches get moved for people to sit and there’s nowhere to move them in this house, haha! So, I wanted the few I use to really be well-chosen and pack a punch! 4.) White Buffalo Photograph – I know I said it in an earlier post, but my goal is for so many things in this home, especially on our walls, to have meaning to us. 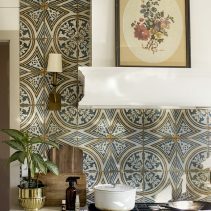 I’m trying to focus more on making a collected, purposeful home. I found this white buffalo photo and it represents sooo much of what we do and how we’re trying to live our life. Plus, I love the rustic feel of it. 5.) Lucite Coffee Table – I decided early on this was the way to go because I love that it provides a surface for things and a foot rest, but it disappears and doesn’t take up visual space. That’s so important in a small space where a lot has to go! I also love that you’ll be able to see the rug through it! 6.) Navy Sofa – I found a small-scale sofa I loved that was a reasonable price and looked comfy. While I love light sofas, I knew that wasn’t an option with our young children and Gracie. I thought about a deep navy/green with the rest of the room elements and love the Zula Navy fabric this one came in. 7.) 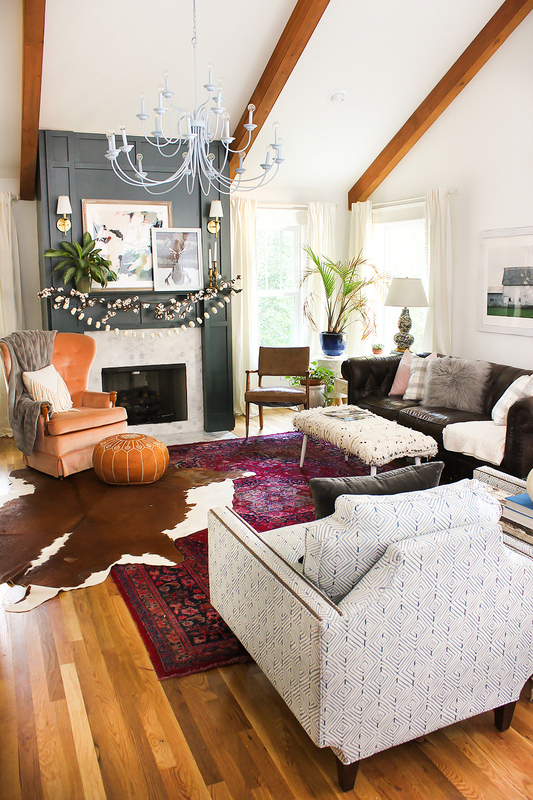 White Antler Chandelier – This is our main splurge for this house if I had to pick one. Long before the partnership with Wayfair came about, Chris and I both said we wanted a white antler chandelier in this living room. Y’all I have wanted one in my living room for the last three I designed and never could justify the cost. But we both decided that it would be so special and with the smaller living room, we’d need a smaller one, saving cost. Plus with all we were saving by not adding on, we decided a teensy bit of that could go to this chandelier. And what’s funny is that this item is a lot less expensive than our sofa and other things we’ve had to buy, but we’ve just never spent much on light fixtures. But, I have chills when I think about this baby in this room! And when we move on from this house one day, she’s likely coming with us. I’m not letting her go. 8.) 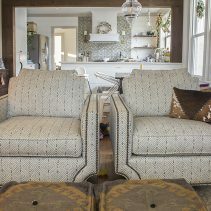 Tufted Leather Chairs – I really wanted some leather in this room since we lost that with our sofa. 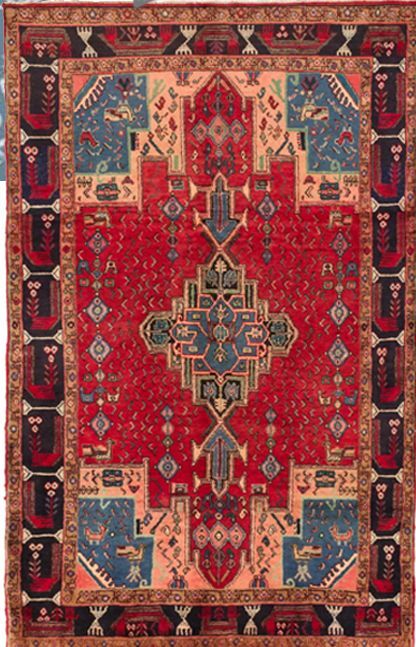 Chris LOVES it and I’ve really grown to love it too…it adds texture and warmth. I fell in love with these small-scale chairs because of their look, but then they were some of the smallest and most reasonably priced chairs I found! I still can’t get over the price of these for the style. 9.) Hanging Macrame Planters – I love bringing life into a space with plants and you know every room I do will have some boho-collected touches. These will be in the space, but they’re also a hint and more layers to come. 10.) Vintage Floral Curtains – I said in my whole house design plan post that I’d be using vintage floral in this home a lot. It just screams country house to me and it’s one of the few things I’ve loved since I started designing seven years and four houses ago! It’s made an appearance in every single house! My mom already had this vintage fabric from an old remnant sale and we’d been saving it for just the right thing. Once this design started coming together in my mind, I remembered it, called my mama who was storing it and she measured it. We had literally just enough for two curtain panels! This collected living room is coming together! I’ll be sharing several posts about this space next week that’ll show you progress and how it’s coming together with furniture and basics! Then the reveal won’t be long after! Those are great selections. I’m excited to see it all come together! 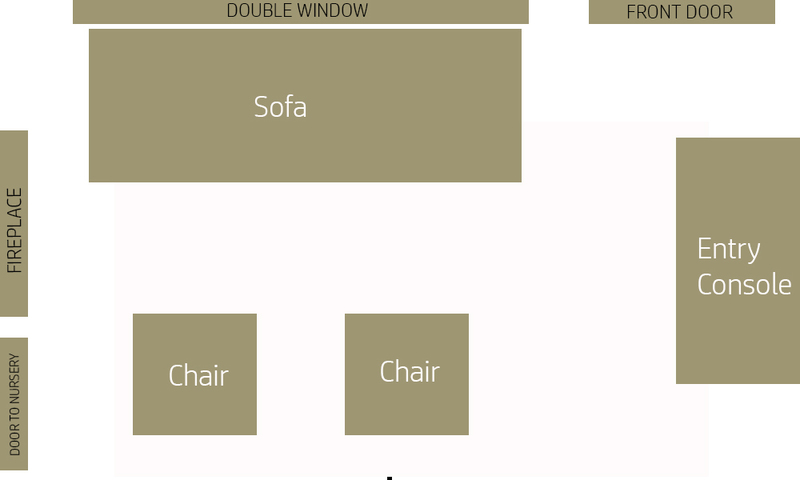 I feel your pain on trying to determine a good living room layout. Our living room is an okay size at 15 x 17, but I have to work around 3 doorways, a chimney, a heat vent and cold air return vent on the floor, 1 window, 1 window opening (no longer a window). It’s a nightmare and I still haven’t come up with a layout that we love. It functions, but it’s not pretty. Oh well. Someday. Until then, I’ll live vicariously through you and your pretty designs. Ha,ha. Oh my gosh, I know! It doesn’t even matter how big and spacious it is when you have so many things to work around – still a huge challenge! This one definitely isn’t perfect, but it’s also life in a small house with many limitations haha…I’m determined to make it work for us! Sad as I am (I have about 4 different angles of your old living room pinned on Pinterest), I can’t wait to see how you make the most of this space and I love the mood board! It looks so good! What a fun partnership – can’t wait to see progress and the final reveal. I think a space with lots of entry/exit points is more difficult than a space that is just small. All those pathways! Also, love seeing how you’re re-using furniture and decor from the other house. That’s half the fun of moving! Discovering new ways to use old stuff!! I love what you’ve put together for your living room. You have great taste and a great eye! I think you have solved the dilemma of how to arrange the LR! I think it’s going to function well and be so charming! 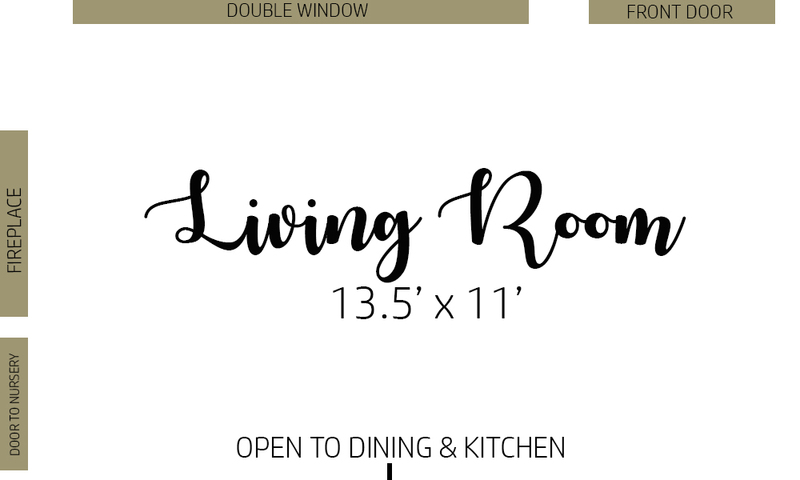 When I first saw your floor plan, the first thing I thought about was how you were going to arrange furniture in the LR, especially with the front door opening into it. It’s hard to go from having a spacious area to not having one, especially with children and toys! When I looked at the fabric for your curtains, I kept thinking it looked very familiar. Pretty sure it’s a Waverly. Just looked in my closet, and sure enough, I have several place mats that I’ve been storing that I think are the same pattern! They are so pretty that I just held on to them, even though I don’t need them. Oh Debbie that makes me so happy!!! I am so in love with this fabric and wondered what it was! I should’ve thought about Waverly – they always have such beautiful florals! Yes, already this living room is feeling tight with children and toys haha! But I do think this is the best arrangement! Good to teach us what we do and don’t need! My hubby and I are empty nesters and we sold our 106 year old in town farmhouse this summer and bought a 3 year old small home and we love it. It was so fun to decorate and my motto was keep it simple….we love our small home and are so glad we did it. It sure is easier to keep clean too! I look forward to seeing the reveal. God is so good!!! Thanks so much LeAnn! Oh that farmhouse sounds amazing, but excited y’all made a similar move! It’s already been good for us in many ways! It may not be forever, but it’s teaching a lot during this season! HI Kristin! No, we stored the chairs. We went into this house saying that whatever didn’t fit was going, but we couldn’t bring ourselves to do that with the chairs. They’re just too special and we know they’ll likely fit in another house one day. If there isn’t a spot in the next house one day, I may do that then, but hoping there will be. I love them so! And I use photoshop 🙂 Mine aren’t to scale, but it does help you visualize it! When I’m really worried about scale and need to see that, I sketch it out on graph paper!